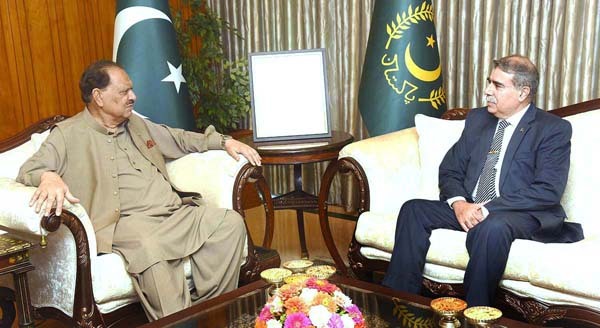 ISLAMABAD, July 4 (APP):President Mamnoon Hussain Wednesday said as Pakistan and Nigeria were close friends, there were immense opportunities of cooperation between the two countries in various sectors including trade and commerce. He said this while talking to High Commissioner-designate of Pakistan to Nigeria Major Gen (Retd) Waqar Ahmed Kingravi who called on him here at the Aiwan-e-Sadr. The president said continuous efforts were required to further enhance this cooperation. He underlined that Nigeria was the largest and important country of Africa and Pakistan had important trade ties with it. He directed the high commissioner-designate to focus on exchange of trade delegations as there were numerous opportunities of trade in different fields between the two countries. He said Nigeria was also keen to further expand trade relations with Pakistan which could pave the way for further strengthening economic cooperation with whole Africa. The president said there has been strong cooperation between Pakistan and Nigeria in health and education which decreased with the passage of time. He directed the high commissioner-designate to include these matters in his priorities.